CLICK HERE TO DOWNLOAD or use the attachment link at the bottom of the page. 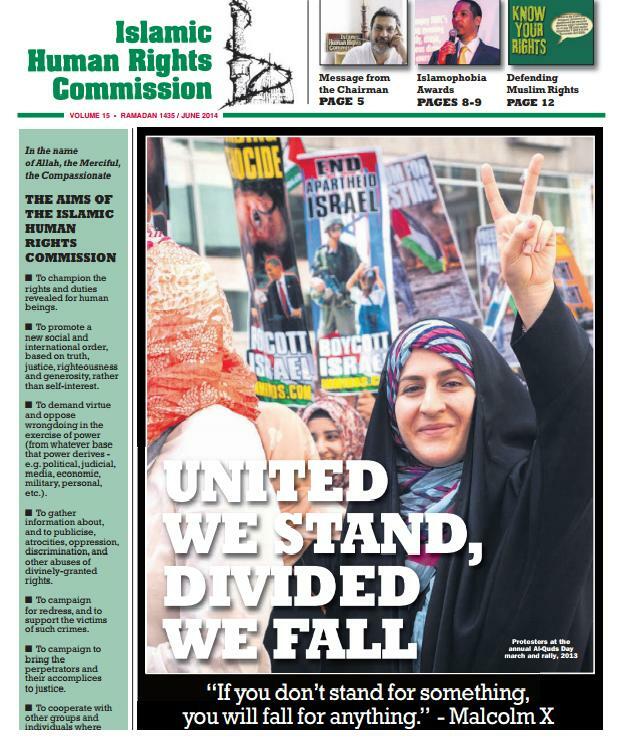 This year we lead with commentary on the lack of unity between Muslims today. Touching on the global ummah’s inability to recognise Western machinations and the general disillusionment when it comes to the Arab Spring, it is made clear why it is important (now more than ever) that we band together. Pick up a copy and remind yourself of the past year’s events and activities. The beginning of 2014 saw IHRC hold Genocide Memorial Day and host the Islamophobia Awards after a long respite. There have been exhibition launches and author evenings, book publications and United Nations visits. We offer free advice surgeries, Know Your Rights workshops and this year, launched a new legal department too. Equally important has been our efforts in terms of advocacy and campaigning. Our briefings on the Immigration Bill 2013-14 as well as the amendments to Schedule 7 of the Terrorism Act 2000 were sent to MPs and Lords and in this year’s newsletter we make special mention of our campaigning in relation to Bangladesh, Bulgaria and the UK.